Although relatively short, this is such a difficult read for me. I don’t know if it’s because of the “future world” described by Bradbury with true absurdity, or just because of its dark and gloomy feel. Guy Montag worked as a fireman. But instead of putting the fire off, firemen in his time was told to start fire, to burn the books that still existed although it’s been banned for quite some time. Guy tried to be a good fireman, to not be tempted to sneak some books or question anything about his job. But then one day, after meeting a neighbor girl, Guy was beginning to think. The girl told Guy that there was a time when people were not afraid, when they talked to each other instead of talking to TV, a time when books were everywhere and people took time to do everything. Guy realized he had to do something, and he made a very big decision that will change his life -and the world around him- forever. Although in some parts Guy Montag’s world was pretty absurd (four walls television installed in each house, people zooming in the streets inside their speedy cars), somehow it has a great resemblance with our current world. Maybe that’s why this book becomes a classic. 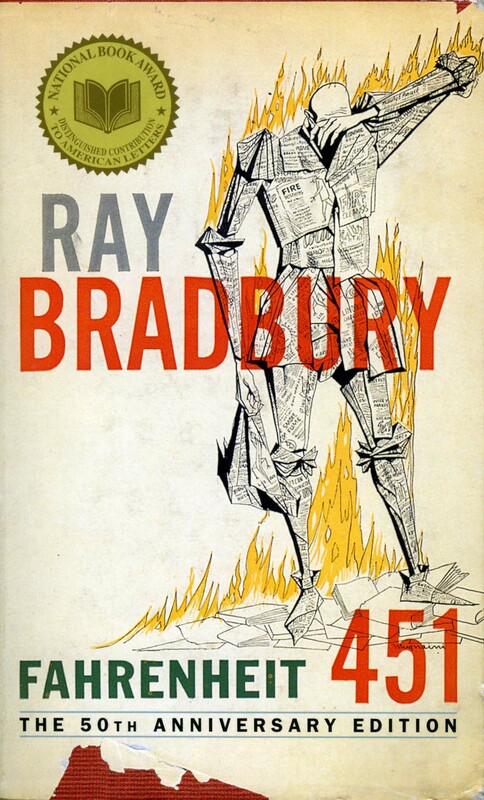 It is as if Bradbury could predict the future – and the doom that awaits there. People lived like robots and if we’re not careful enough, we could turn into ones pretty soon! The darkness inside this book made it hard for me to finish it quickly. I kept holding back, tried not to think too much if someday, one day, books are banned in our world. It’s like the end of everything. If there are two buildings remained intact after a huge earthquake, one of them should be built into a library. Because reading is at the center of our lives, the library is our brain, and without it, we have no civilization. Note: Fahrenheit 451 (232,7 Celcius) is the temperature when books could get burnt. Belakangan bolak balik liat buku ini, 1984, bersliweran di mana-mana deh!